Home-stay vs. cattery - what are your options? Going on holiday is a time for relaxing and forgetting your worries, but when you have a cat that isn’t going with you, arranging its care in your absence can be a stressful time. If you’ve never left your cat before, knowing what the best option is is tricky, with no way of predicting how it will cope. When planning your cat’s care, the less upheaval the better. This isn’t always achievable but forward planning will ensure your cat manages, even enjoys, your short break from home. Many people prefer to leave their cats at home and have a cat-sitter come in daily to feed them. A friend, family member or professional can do this, providing you trust them with your furry friend. A cattery is another option for those who can’t rely on or afford someone to come in every day to care for their cat. Catteries suit many owners and many cats, although some can find them a bit upsetting at first. Whatever you choose to do, as long as you plan well in advance, you needn’t worry about your cat receiving the right care. Cats are territorial creatures that would probably opt for staying at home while you’re away, if given the choice. Cat-sitting involves someone stopping by to feed and comfort your cat, either on a permanent stay-in basis or at regular intervals. For your cat, this means keeping its environment, all its creature comforts and enjoying the same routines as when you’re there. Cats that don’t like change and are unaccustomed to travelling and meeting new people will probably fare much better with this arrangement. Cats that like coming and going as they please, are not demanding of attention and adjust to new faces quite quickly, are the ideal candidates for a pet-sitter, whether it’s a professional one or a trusted friend or neighbour. Even so, it might still be worth using a Feliway diffuser in your home to keep your cat calm while you’re away. Like dogs, cats are very intuitive and can tell when something’s different, so it is important to make as few changes as possible. If your household is usually busy and loud then going to emptiness and quiet can make a cat feel anxious and confused. Arrange with your pet-sitter to visit at certain times (according to your cat’s established routine) to keep feeding and play times the same. Schedule visits every 24 hours (the more visits, the better) so that any medical issues with your cat can be noticed early. Ask the sitter not to move your cat’s toys, scratching posts and beds around too much, or introduce any strong odours that your cat won't recognise. In short, encourage a stress-free environment by keeping the house as untouched as possible. Sometimes there is no alternative to placing a cat in boarding when you're out of town. Not everyone has friends and relatives that would be willing to take a cat in, even for just a short period of time. The standard of catteries varies enormously these days, so do your homework before deciding where to place your cat. Don't be tempted to choose the cheapest option, as price often indicates the level of care provided. Good catteries will allow you to pay them a visit before your cat is boarded there - some even encourage a trial weekend to acclimatise your cat to its surroundings. You will be able to check out the facilities, amount of space, condition and staff to decide whether it's the right place for your pet. You will also get the chance to ask questions and discuss anything that might be bothering you. If your cat is on medication or would prefer to be boarded with other cats from your household - it is worth finding out what your options are. When it comes to finding the right cattery, choose somewhere you get a good feeling about. Is it clean and light, with sufficient ventilation? Is the temperature right? Do the staff seem knowledgeable? Is there enough space for your cat to move comfortably? 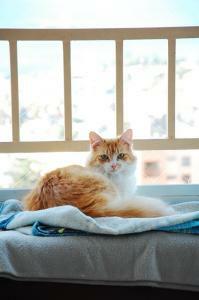 Do the other cats in the facility look happy and well cared for? You also need to find out what the requirements for vaccinations and worm/flea treatments are before you drop your cat off, as some catteries will refuse to take in animals without seeing up-to-date vaccination certificates. They will also refuse to take cats that are critically ill or appear to be. It is important to make the environment as comfortable and homely as possible for your cat, to keep the upheaval to a minimum. Scratching posts, toys and bedding, along with other items and playthings that are associated with home, should be brought along and placed in your cat's alloted space. These will help create the feeling of a home from home and make the transition much easier. Likewise, find out what the cattery is going to feed your cat and, if possible, bring along your regular food so that your cat doesn't have to adjust to a new diet too. The stress of a feed change added to new environments, faces and routines can trigger stomach upsets, so providing your cat's usual diet is definately worthwhile. It says above that some catteries may refuse to accept boarders without seeing an up-to-date vaccination certificate. In the UK, it is legislated that all boarding cats in catteries must have up-to-date vaccinations and boarding catteries need to see the certificate or speak to the veterinary practice where the cat was vaccinated. Please be clear that no cattery in the UK can accept an unvaccinated cat. We have an 18year old cat who comes on holiday with us as we stay in self catering cottages in england, it is the best thing for her and for us as we don't have to worry about her. A lot of cottages which accept dogs will have cats aswell if you ask the owners when you book. We leave our cats at home, and our friend comes in to see to them twice a day, spending some time with them in the evening. We do not go away for long or very often but the cats remain settled and undisturbed. I have recently opened a licenced cattery and have installed cameras in the pens so client can see their cats 24 hrs a day should they wish too! I have adopted all the things I wanted from a cattery and could never really find I those near where I live! Our boards are treated the same as my cats, fused, played with, groomed, checked physical daily and all in view of my clients as I have nothing to hide! So I would add the camera option as something to look for in a cattery! There's no hiding!! All my cats have been boarded at Pampurrs Cattery Southampton.They seem to settle well & are given a lot of care & attention. I would not want to leave them anywhere else. I'm a very large Maine Coone who needs lots of space. I stay at Country Cats Hotel in Briston - Norfolk. We all have individual chalets with all mod. cons. I love my visits to this holiday home and am always reluctant to say goodbye when my humans come to collect me! As we switch between 2 homes for 3/4 months at a time, our cat (Blackie) always comes with us. However, there are one or two occasions during the year when we have to put him in a cattery for a week at a time. Fortunately, the cattery owner in North Somerset got to know Blackie very well back in 2013 when he had to stay there for 2/3 months due to my mother being in and out of hospital (he originally belonged to her for 10 years). He became a special favourite with her as she got to know him so well - she had tears in her eyes when we made the decision to take him home with us as Mum had to go into a care home permanently. She's always glad to have him back and really takes special care of him as he is a very nervy cat. Blackie has bonded with me extremely well (much to my surprise as I've never been the primary carer of a cat before in my life) and the only reason I dread putting him in the cattery is the howl he makes as we leave him in his pen. I end up in tears! As I have an 8 kilo cat who requires a lot of food, and cannot digest dry kibble, I find that leaving him alone for a couple of days, safely shut in the house, with food, is better than a cattery. I prepare his three daily meals for the two days (raw meat, cooked meat, and tinned cat 'cake') and then freeze them according to when he should be eating them i.e. the first fresh, the second lightly chilled, the next frozen lightly, etc. He is left with radio 4 to listen to and a calming diffuser. As you will understand, feeding him is something of a problem for longer stays in catteries, as I have found that the owners tend to think they know better than I do as regards feeding dry kibble, as well as frozen meat left with them, and the cat ends up sick, despite luxurious surroundings. I pay someone to come in twice a day to feed and cuddle our Siamese cat. She sends us photos of Toby and he is fine at home.